To know the Nightmare Factory Book Club is to revel in genetic anomaly. Our members are celebrated for their exquisite, phenotypic eccentricity, and our pursuit of absolute, biological perfection has been known to turn heads the full 360°. 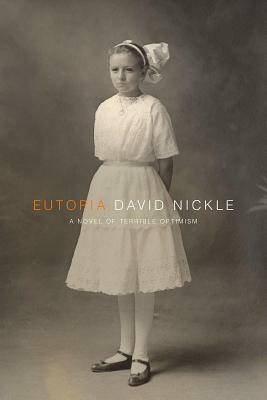 To this end, we were delighted to indulge in Eutopia: A Novel of Terrible Optimism by David Nickle this month to see how our eugenic forebears curated the horrible forest of aberrations we inhabit today. Join us tonight at 7:00 p.m. in the cafe at BookPeople to discuss this bizarre, literary delicacy, and together we’ll see just how weird things can get. Eutopia is an analytic investigation of William Howard Taft’s America – a time in this country when utopian societies were still grand experiments, genetic purity was still a worthy ambition, and the vivisection of unwilling test subjects was accepted as the necessary reality of a fledgling scientific method. An isolated logging community on the cusp of a deep wood is administrated by a visionary industrialist with a solution to organic imperfection. A young man is the sole survivor of a city-killing plague, his blood holding the potential to inoculate the world from sickness. An ancient faery god haunts a mountain community, secreting religious ecstasy at the cost of living, human flesh. David Nickle has created a surreally disquieting world that exposes the dark underbelly of the Progressive Movement and no one is safe from his aggressive perfection. The Nightmare Factory Book Club meets on the third Tuesday of every month at 7:00 p.m. in the cafe at BookPeople to ruminate over all things gruesome and grotesque in the literary world. Join us tonight March 21 to examine Eutopia by David Nickle and see what makes it tick. If not just for you, come for the betterment of the whole, human race. Next Post New Books 3/21!